Under their Sonicflight label, MIDI-mouse Music has released two new patch editor/librarians, one for owners of the MT-32 synthesizer and one for owners of the D-50. 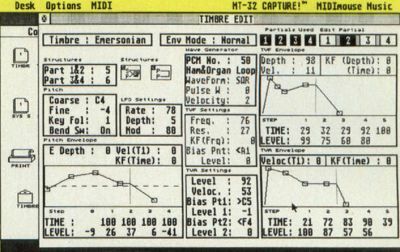 MT-32 Capture is a full GEM application that provides windows and icons for the display and control of the MIDI data being manipulated. As well as the usual editor/librarian features, MT-32 Capture provides a randomize feature that allows the generation of completely new sounds within user-definable parameters. 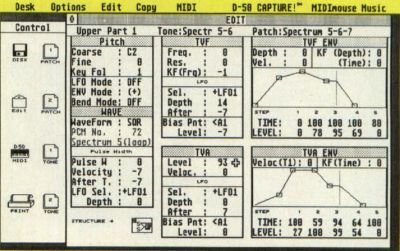 D-50 Capture is very similar to MT-32 Capture, giving owners of the D-50 synthesizer complete patch editing, programming and librarian functions. It also retails for $99.95.